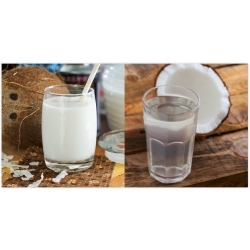 What is the difference between coconut milk and coconut water ? Coconut milk and coconut water are two completely different things. Coconut milk is white in color. It is made by crating and pressing the white coconut fruit meat that you find on the inside of a mature, brown coconut. The milk has a much higher fat and calorie count than coconut water. Coconut milk is mostly used in cooking or as a component in smoothies. Coconut water is the liquid found inside a young, green coconut. It contains minerals, is low in calories, sugars and fats. The electrolytes in the coconut water make it similar to humans blood plasma. This enables our bodies to absorb necessary electrolytes efficiently and makes coconut water the only naturally occuring isotonic drink. Coconut water is a great alternative to juices, sodas and sports drinks since it does not include added sugars or preservatives......oh and it tastes awesome !! !